Hello All! Sorry about the lack of posts this week! It has been crazy! Makenzie is feeling much better! She still has a little bit if a runny nose but nothing like this time last week! Thank You Jesus!!! I was ready for the nut house! We had a meeting with Child Find on Monday. It was very long and unproductive. We went iin to write a draft of Makenzie's IEP (education plan) for preschool. We left with a blank draft of Makenzie's IEP after nearly 3 hours! Befor we went to Florida, Kenzie and I went to a school to check out on of the progams this school distric offers. The program was good but not right for Makenzie. Public Schools have some therapy but not like what Makenzie gets at home and not really anything to get excited about. With that being said sending Makenzie to preschool would be about socialization. I told Child Find that we wanted to put Makenzie in a blended classroom with kids her age, with and without special needs. Makenzie loves kids and they are a huge motivation for her. They were less then thrilled and made some statements that completley underestamated my daughter! So,today we went to visit another school and it was great! The hustle and bustle of the classroom had Makenzie smiling from ear to ear! I was able to talk with the teacher and she said all of the right things! They were very warm and inviting unlike some of the other classrooms we have asked to observe. She assured me that if Makenzie was a part of her class that every activity that they did would be adapted for Makenzie's needs!!! I am so excited! If we can get past the politics she will be starting the begining or end of July! I will be setting up another appointment with Child Find to fill in that blank draft with more fitting goals and a more suitable classroom setting for Makenzie. 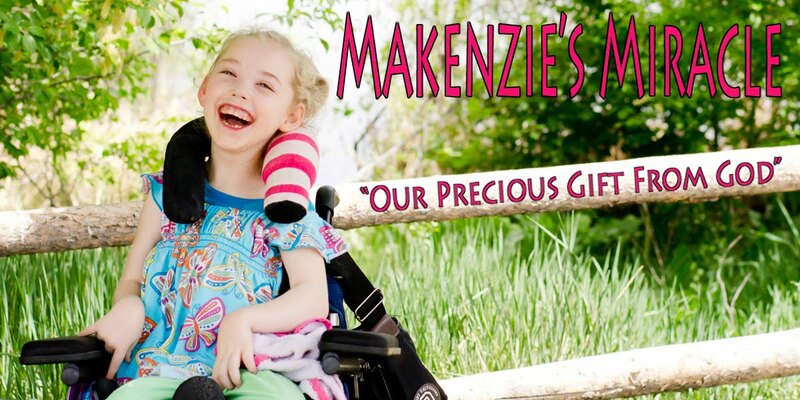 We will also be asking for a full time aid to assure Makenzie is safe and gets the most from this experience. Please pray that this goes well and that the district doesn't make this a struggle or a headache! Makenzie seems to be back to her happy self! Even with her being sick and not doing well with her food she only lost about 3 ozs!!!! Yeah God! She was amazing in therapy today and was full of babbles!! She has been making a lot of new sounds and is responding to questions and statements with very good, strong noises!! We are so proud of Makenzie!!! God is in control and we are so thankful for His many blessings!!! Keep Praying!! !